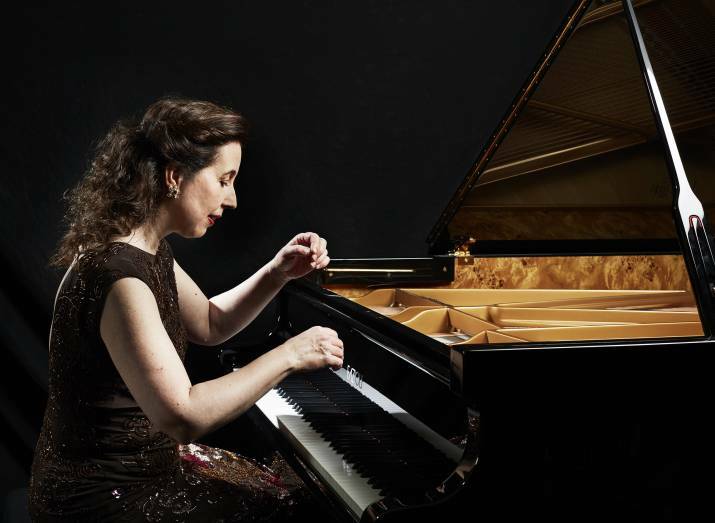 The Canadian-born pianist has appeared here under a few organizational banners – Melbourne Symphony Orchestra, Impresaria, Australian Chamber Orchestra, and Musica Viva which is sponsoring this latest tour of two programs and a clutch of masterclasses. Oddly, her stellar Bach recordings and live appearances with the Australian Chamber Orchestra don’t rate a mention in the MV program, which is a pity because her readings of the concertos and even a strange Brandenburg No. 5 where she has the solos and Linda Kent’s harpsichord does continuo duty were/are remarkable weddings of soloist and accompaniment. On Tuesday, Hewitt opened with Bach, of course; you don’t build a reputation like this, with its attendant expectations, and then avoid the obvious; God knows there’s plenty of material to deal with. For both programs on offer, the pianist is performing two partitas, the big No. 4 in D Major (which is common to both nights), balanced – sort of – on this occasion by the better-known No. 1 in B flat. After interval, we branched out into five Scarlatti sonatas, the Ravel Sonatine, and the final solo piano work by Chabrier, his Bouree fantasque. No short-changing in her Bach, Hewitt played all repeats; like every pianist with sense, she made sure the second time around was more than a simple here-we-go-again exercise. For the familiar B flat Partita, she impressed as always by the clarity of her linear work. Given her instrument’s ability to make life easy, she continues to be most sparing with the sustaining pedal, which makes her load more taxing but fills these pages with a welcome sparkle; even the opening Praeludium with its (mainly) three layers came over with excellent lucidity, aided by a supple dynamic range that avoided heroic clangour. This clear-speaking delivery continued through the work’s dances, notable for a sturdy Sarabande informed by a gently applied rubato, and as close to ideal as you could expect in the concluding Giga in which the supplementary quavers enjoyed a burbling subservience to the crotchet melody line – far from the more common and leaden Solfeggietto cross-hand exercise we usually have to endure. For the D Major work, Hewitt began the Ouverture with an attractive declamatory style that emphasized the key movement rather than the brusqueries of the demi-semiquaver scales and written-out ornaments, before a stunning account of the movement’s latter section that begins with a light-hearted fugue motive before working into a striking polyphonic complex at about Bar 62, a nexus that doesn’t take itself too seriously; in Hewitt’s hands the bouncy good humour is maintained, particularly through the bass-heavy bars 105 to 109. The following dances and Aria became intriguing for the executant’s mode of presentation rather than for her technique which was hard to fault: the poised solemnity of the large-scale Allemande where Hewitt made the occasional triplet or pair of them serve as placid disturbances of the regular metre; a sturdy drive in one of the finest Courantes from the composer; a similarly firm impetus in the odd-man-out Aria; the deft folding-in of the Sarabande‘s opening two-bar question with its lengthy, ornate response; in the Menuet, a simple example of art concealing art in the gentle handling of congruent triple and duple passages; all capped by a buoyant Gigue where yet again the more active passages of interplay – like bars 16 to 19, or 78 to 85 – delighted for their purity of detail and Hewitt’s remarkable gift of keeping three balls in the air. The post-interval events began with five Scarlatti sonatas. Two of them were among the composer’s most well-known: K. 491 in D Major, and the E Major K. 380. If anything, Hewitt makes these works speak more simply than many another pianist; her chording is less flamboyant or filled out, the ornamentation veers towards spartan, dynamics rarely move below mezzo forte. The D Major K. 492 enjoyed brisk treatment, a fine contrast with the courtliness of the two better-known sonatas. And the final K. 24 in A Major came over with plenty of braggadoccio, the pulse maintained throughout without turning towards a martellato effect. I must admit to being distracted by the middle work in the bracket, listed as ‘Sonata in B Major, K 377’ – a piece I didn’t know and which proved even more unfamiliar as it was actually in B minor; puzzling about this and doubting my sense of pitch distracted from whatever Hewitt was accomplishing with it. The Ravel piece also came in for firm treatment. Hewitt is not disposed to apply washes to these pages and the Modere, despite its lush underpinning figure-work, impressed for a no-nonsense delivery where ppp remained a definite entity rather than a wisp. The Menuet impressed for the rhetoric brought into play at its central climactic point, while the concluding Anime gave the pianist ample space to show her talent at unflustered dexterity in what amounts to a toccata, albeit a remarkably tautly structured one. The only quality missing was verve, like the elation you experience when hearing the main motive striking out from an underlying susurrus of semiquavers. Hewitt has a passion for Chabrier’s piano music, and most of us know too little of it to sympathize one way or the other. The Bouree fantasque is a formidable show-piece without much substance but packed with excitement and flurries of virtuosity. This performance was lively enough, if it lacked the punch that you can see in the score; the reading caught fire at the return of the main theme proper after Chabrier has finished with his F major central section and the florid chromaticising he employs to get back to his C minor home key. The final rousing 24 bars brought this entertaining if unwieldy bonbon to a glittering conclusion. Hewitt plays her second program on Saturday May 20 at 7 pm. Along with the Bach Partita No 4, she will play the C minor Partita No. 2. The rest is Beethoven: Sonata No. 1 in F minor and the Moonlight No. 14 in C sharp minor.